Does anyone know why some mid arms are so much less than others? As an example, the Artistic SD and the Tin Lizzie 18 are both about $3k less than the HD Sweet Sixteen, which has a shorter harp space, but they are generally comparable. Some have stitch regulators, but that isn't a big draw for me. I've read lots of reviews and they all "seem" to get good reviews, although HD gets the best for customer service on their long arms. I own a 15" Bailey, purchased for less than $3000. No frame included, no stitch regulator ( though one's available) and no computorized anything...strictly manual. But it gets the job done beautifully! I think the larger longarms are more of an industrial machine, whereas the midarms are basically stretched domestics. Also, those longarms come with their own amazing specialty frames...most worth thousands on their own. Add to that the lifetime warrantee and service support ( next to none for the Bailey, you learn from other owners and use a regular repair person). Many of the pricier machines also have computorized pattern and robotics capabilities which can be added to. Mine doesn't even have an up/ down needle function. But l love my machine...since l'm retired, and quilt as a hobby for charity and fun, it's all l can afford and need. It could possibly be because the ones you are looking at are discontinued. I just ordered a Janome AQSD18 for less than $3000.00, it is now a discontinued model. Can hardly wait until it gets here. It is offered on Amazon for $2999., and my local dealer told me he would meet their price, as it is a discontinued model. Hmm, I've seen loads of complaints on the Tin Lizzies and it is my understanding the Janome Artistic is the same machine just rebranded. This is not an uncommon practice. HQ makes the Baby lock mid and longarms. Granted there are many who have them that love them. As for the difference in price, a stitch regulator will account for that much difference in price. My first long arm was a Tin Lizzie 18. The machine itself ran fine, was very easy to set the tension and was not fussy at all about thread. The stitch regulator was another story. Could not keep it operational. I finally learned to quilt without it. The frame was the older style, without a dead bar. Advancing the quilt was a PITA. I traded it in on a HandiQuilter Avante (18"). The frame is much sturdier and has a dead bar, and the stitch regulator actually works. I would make a list of what all is included in the price. Make sure that you look at the stitch regulator, and frame. Many Sweet Sixteens are sit downs, or come with a 'mini' frame. Also, are you comparing prices from US or Canadian dealers? US dealers. Even factoring the exchange duty and taxes it's about fifteen hundred cheaper. I have the Pfaff P3 which is basically a Tin Lizzie - it runs well, isn't finicky with thread and is easy to re-time if needed - my husband did it after watching a youtube video. I had a friend here and she got too quick with moving it and the needle must have hit something... anyway, after a few minutes he had it up and running again. Check Kijiji and Craigslist for a used machine. Also, quilting forums, like APQS's have used machines for sale (all kinds/types) privately. I bought my first midarm, a Sweet 16 Sitdown privately, in Canada and got a pretty good deal, better than buying new in the US. 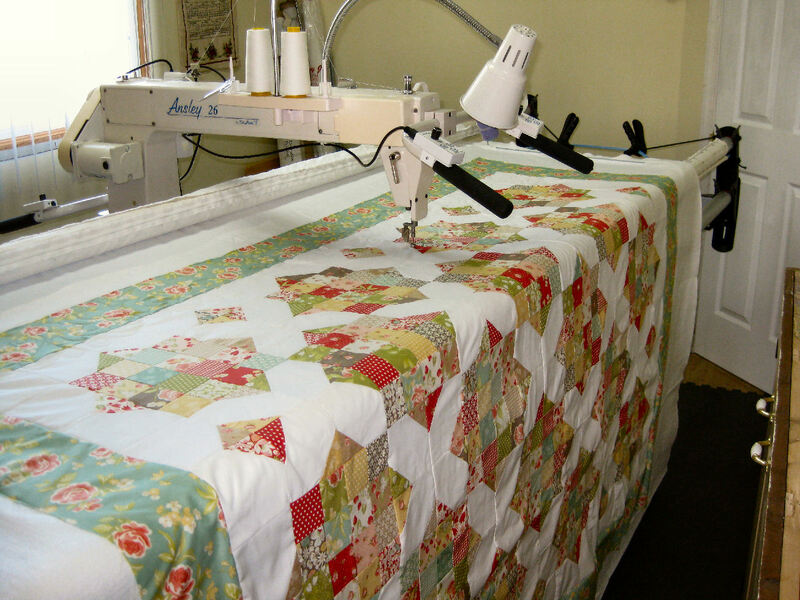 Handi Quilter was very supportive direct from the factory as I had no dealer. APQS is also very supportive to work with, backing their machines and a pleasure to deal with. There is a good number of dealers in Canada for APQS too. I now own an APQS longarm and purchased thru a CDN dealer, so that's the extent of my experience. Good luck with your hunt! Hey Watson, I tried just about all the sit down mid and long arms over the last couple of years. I was not thrilled with the Tin Lizzie or the Janome that was made by Tin Lizzie- can’t remember what exactly it was that I didn’t like. Otherwise, I thought all the others had something good to recommend them. I would have been quite happy with the Juki, Innova, Bernina, Sweet Sixteen, Tiara, etc sit downs. But even at show prices just couldn’t afford them. I ended up buying a used Sweet Sixteen that had barely been used, (just a little over 600,000 stitches on it). It came with the bobbin winder, horizontal thread holder and also a bunch of upgrades incluing the couching foot set, the echo foot set, the glide foot, electronic tension adjustment, extra bobbbin case and a gazillion bobbins and needles and also the two table extensions and the table overlay. I paid $3700. Found it on Ebay and was able to avoid shipping costs since it was in driving distance. I have not had any trouble with it. The instruction manual that came with it is very good and Handiquilter has tons of helpful videos up on Youtube. It took me a little over a year of searching ebay, craigks list and facebook marketplace before this machne showed up in my price range, but for me, it was well worth the wait. Last edited by rryder; 05-10-2018 at 03:54 AM. Short answer........quality or lack thereof. I was going to give the Tin Lizzie a spin at a quilt show even though I have a Gammill and a friend said don't waste your time. She had a lot of negatives to say as she had a Sweet 16 longarm to compare to, so I just walked on by. I'm a proud Tin Lizzie owner for 6 years. I have an Ansley 26" machine and it has been a joy to use, a real work horse machine. I have the Hailey frame which advances easily and I haven't got a single negative thing to say about this great machine. When I've needed tech support they are always eager to help, even though each time it was user error. If I had to buy another machine it would be another Tin Lizzie for me. Here's a picture of my latest quilt. I love my Tin Lizzie!